Stamping Sara: Thanks a Latte! It is end of the school year time. Teacher appreciation was a couple weeks ago but I was booked solid with subbing jobs. I think it's important for kids to acknowledge the work their teachers have done with them this year. Teacher gifts are of great debate at my house these days. Lizzy is a fan of the flowers. Simon is a fan of music. I really didn't want to do any of these. I started to make these cute arrangements but really I was more motivated to clean this weekend (I know what was wrong with me??) than I was to make paper flowers. Lizzy did not feel this filled the order. She wanted to give her teacher roses and chocolates. Simon said "huh, that's weird mom." So the bouquet idea has been shelved (maybe beginning of year gift??) and we moved on to coffee and cookies (no roses but school isn't out until Thursday). I thought chocolate chip cookies would appease the chocolate monster (Lizzy) and the pun (thanks a latte or miss you a latte) would satisfy my ever witty third (almost fourth) grader. Of course I was kicking myself when this idea finally came together for me. 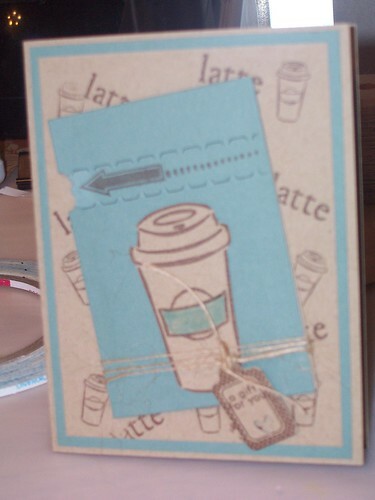 I have been coveting a coffee cup stamp and the movers and shakers stamps from Papertrey. I needed them for this project but haven't pulled the trigger yet. Then I remembered all the many stamps I already have and started digging around. I hodge podge some various sets to get a similar look to the stamps I wanted. Really I should be doing this more often but half the fun of a hobby is the shopping for the hobby. I finally pulled out the zipper dies from Papertrey Ink. I had an immediate love affair with these dies when I saw them on the countdown to release night. I ordered them in February and I am finally breaking into them at the end of May. Record time for me! If I were a good blogger I would have made an extra card so I could pull the tab and show you what's underneath. But alas, I am not that good. I created a zipper "pocket" by cutting two of the vertical zipper pieces and then gluing them together around the edges (not on the actual zipper though) and tucked a Starbucks gift card inside. I am off to finish up the infamous Jacques Torres Chocolate Chip cookies and my accucut GrandeMark challenge project.